What role will you play? For the Church, there is no distinction between defending human life and promoting the dignity of the human person. The Texas Catholic Conference of Bishops’ work at the Texas Legislature starts with supporting efforts to fund health care providers whose goal is to prevent women from making the tragic mistake of choosing abortion. This also means we oppose all public funding to abortion providers, including funds for the use of contraceptives. While abortion is one of the most frequently performed surgical procedures in the United States, data on medical complications is not available. Currently abortion complication reporting is ineffective and lacks enforcement, particularly when complications are treated outside of the abortion facility. This prevents policy makers from having accurate information about the complications of abortion and skews data on maternal morbidity outcomes. Requiring primary health care providers, hospitals and emergency medical service providers to report on abortion-related treatment; establishing parental notification laws; prohibiting lawsuits for “wrongful birth” and other legislation that requires transparency and accountability for a largely unregulated industry can assist in raising awareness of the wrongs suffered by women who subject themselves to abortion. The child lost through abortion is also honored in legislation strongly supported by the TCCB. Catholic cemeteries are stepping forward, working with the Catholic bishops in Texas, in response to ongoing efforts to provide a proper burial for children lost to abortion. Many hospitals already cooperate with families, funeral homes, and cemeteries to provide a proper burial for children who die in utero. Catholic cemeteries in many (arch)dioceses, such as the Archdiocese of San Antonio, have provided these burials for years. The service is being extended to children lost by abortion and will be provided at no charge. The Texas bishops firmly urge all Texans to join them in defending the life and human dignity of all who live in Texas, from conception to natural death. 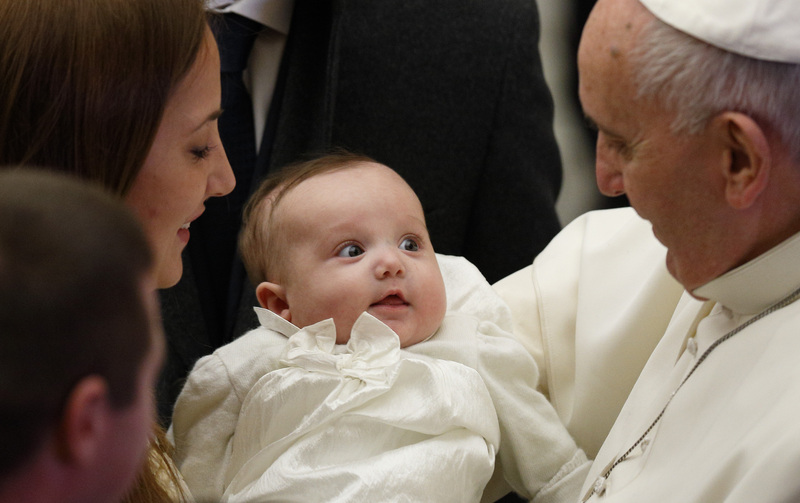 Pope Francis greets a baby during his general audience in Paul VI hall at the Vatican Jan. 7. (CNS photo/Paul Haring) See POPE-AUDIENCE Jan. 7, 2015.